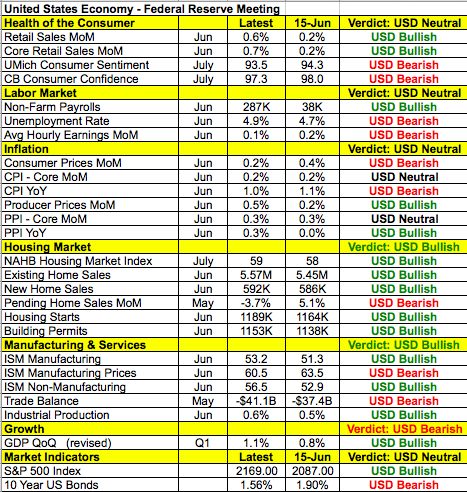 Will FOMC Help or Hurt the Dollar? Meanwhile the Japanese government continues to create confusion and division in the financial markets. Overnight USD/JPY crumbled on reports that Japan’s fiscal stimulus package could be much smaller than expected. While the package could be 3 Trillion yen more than initially planned, it is believed that only 2 Trillion will be allocated to the supplementary budget. This spooked investors out of their USD/JPY trades and drove the currency below 104. Yet the currency pair recovered sharply during the U.S. session rising within arms reach of 105.00. We don’t know how aggressive the Japanese government will be but we strongly believe that the Japanese government will combine fiscal with monetary stimulus on Friday. The prospect of easing period makes the yen a sell on rallies pre-BoJ but trades should be squared ahead of the rate decision and only reestablished after the dust is clear. The best performing currencies today were the Australian and New Zealand dollars. There was no specific news to trigger to breakouts but both currencies have been quietly consolidating after last Tuesday’s breakdown. While the Reserve Banks of Australia and New Zealand recently signaled plans to ease, the massive yield advantage of AUD and NZD may be keeping these currencies bid. Their resilience is particularly surprising in the context of Yen strength. New Zealand’s trade surplus shrank in the month of June with export and import growth slowing but the impact on the currency was nominal. Tonight Australian consumer prices are scheduled for release and the recent increase in inflation expectations points to a hotter number. According to the RBA minutes however, “inflation was still expected to remain low for some time.” USD/CAD raced to a 3 month high of 1.3244 but with oil prices beginning to stabilize and the rally in the currency pair becoming overextended, a correction seems likely. Eight days have past without a pullback in USD/CAD, the longest since January. No Canadian economic reports are scheduled for release on Wednesday but weekly oil inventories are on tap. Sterling and euro ended the day virtually unchanged against the greenback. An increase in mortgage approvals in the U.K. failed to help the currency after MPC member Weale said policy action in August is unlikely to boost the economy before next year. Weale is typically one of the more hawkish members of the FOMC and his cautiousness worries investors. Second quarter GDP numbers are scheduled for release tomorrow – growth should have received a boost from stronger retail sales and trade activity between April and June but investors may discount the report as it fails to capture life after Brexit. The euro on the other hand was unable to find a bid after yesterday’s positive German IFO report. The currency pair pushed above 1.10 briefly only to end below that level for the third day in a row. The pair is currently stuck in a sideways range pattern between $1.1185 and $1.0910. Volume and price action has been somewhat muted as traders gear up for the FOMC rate decision coming tomorrow. There are no Eurozone economic reports tomorrow but action in the pair is expected to pick up at the end of the week as a slew of data is revealed for Germany and the Eurozone.